Veera’s mischievous imaginary pals Tatu and Patu find themselves in an argument right in the middle of a game when they disagree on how vehicles really work. Veera suggests the best way of resolving the spat is for all of them to take a bike-ride to find out. On the trip our trusty trio encounter a whole host of vehicles, each more amazing than the last: different kinds of cars, trains, tramcars and the metro; aeroplanes, a hot-air balloon, mobile cranes and other machines, and a veitable fleet of different ships and boats. But what do Tatu and Patu think would be the ideal, the perfect form of transport? 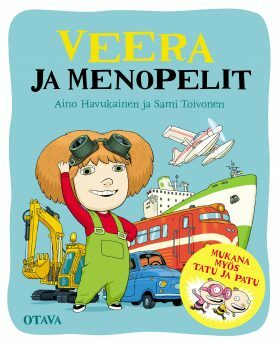 Veera’s Best Ever Book of Vehicles is not all about steel and engines, either. On their cycling excursion Veera, Tatu and Patu show examples of safety and of getting around without polluting the environment. The book’s hilarious and beautifully-crafted illustrations are packed with colourful, wild and ingenious details to please all ages.